Maybe it's because the Tigers appear to be such a good club overall. Or perhaps it's because their competition in the A.L. Central is underwhelming. But the Tigers have a glaring weakness. It's at closer. What will they eventually do? Jose Valverde is a stop-gap measure at this point. I don't believe that based on one blown save, but rather the way he has been throwing overall. His fastball doesn't have much movement, it's thrown at a perfectly hittable speed for major league hitters and his command is suspect. And his split-finger pitch, his money offering, has been tumbling to the plate rather than appearing as a fastball and dropping off a table. It's a non-factor, and why Valverde rarely throws the pitch. The good part: Valverde is a savvy veteran with tremendous competitive character. But that is only going to carry him so far before the cracks in his armor catch up. 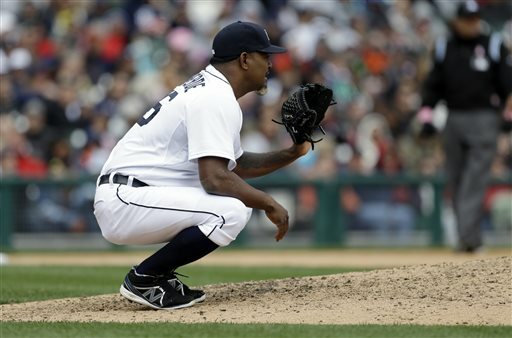 Tiger fans seem to already to have had their fill of Bruce Rondon because of the hype, but he is far from done. He has yet to give up a run at Toledo. A trade remains a likely option for a closer, though, but it's impossible to target which reliever at this early stage of the season. The best trading piece the Tigers have to offer, young hitter Nick Castellanos, is struggling at Toledo with a .237 batting average and a .675 OPS. The only thing that is certain is the Tigers are living on borrowed time at closer and eventually will have to do something to rectify the situation. Pat, you really have this one right. It is really unfortunate with a solid team like this that we're in this situation, one of the most important areas, especially in the summer run. If not fixed, this will lead to some very important losses ahead. Pat, I do agree and this may be hard to get closer especially the way the N.L is playing out. No help from the Fish because their closer is making the minimum. The Rays may want to cash in a trade deadline if they are out but do the Tigers want deja vu again. This also spells trading for a closer and Nick is in the package. Sure he having a tough time at AAA but is still young. Tigers will probably do it because the Tigers have LF cover with Dirks, Garcia and future prospects Collins and Fields. Trading Castellanos for a closer would be asinine. Porcello is a much more likely trade piece, as Smyly is totally ready to take his place. Yeah ...but even throwing fastballs - nothing but fastballs ... for now ... Valverde is getting away with it. Our bigger problem ... sorry . is our DH hitting .221. He's not help Fielder at all - but game after game he is in the five spot. Time will catch up to Valverde for sure - but Martinez has to come to life soon - the DH is not supposed to have the second weakest average in lineup. And Avila following Martinez doesn't help Victor's case either. Maybe if Infante moved up to the six spot? In response to Michael, I do agree not to trade Nick C but you cannot go into playoffs/WS with Valverde and all of baseball knows this. The Tigers have to win now. Mr.I , god bless him, has the reaper on hold. Therefore, DD will have very hard trading for a closer in order to win a WS. If there an ace of a reliever available at the trade deadline I don't think Porcello is enough to get it done under these circumstances. Two players that cannot be traded are Garcia and Smyly. Garcia is the only RF you have after Hunter that could play everyday and Smyly is a great back-up. Good luck DD, but you had relievers in the 2012 free agency to scoop up but he decided to go with Valverde even though he started to fall apart in Sept 2011.